If unicorns were real, this place is probably where they would live. 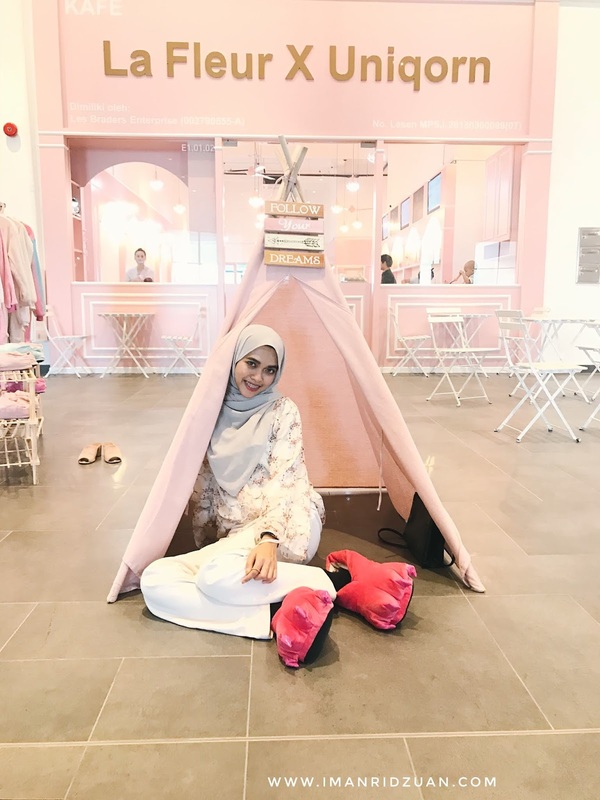 When I first arrived, my heart already fluttered seeing this adorable pink teepee in front of the cafe. As you can see in the picture, they prepared unicorn kigurumis (costumes) and shoes that you can choose to take pictures for free! It really feels like entering into another world with that costume on. 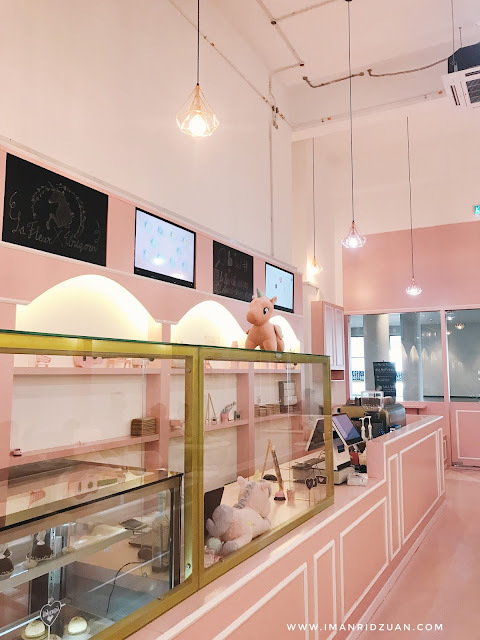 I knew about this cafe from my favorite Australian youtuber, Wengie who just released her own music video titled Cake. They filmed a few scenes in this cafe and it looked super pretty and cute that I just had to come here myself. Check out the music video here! 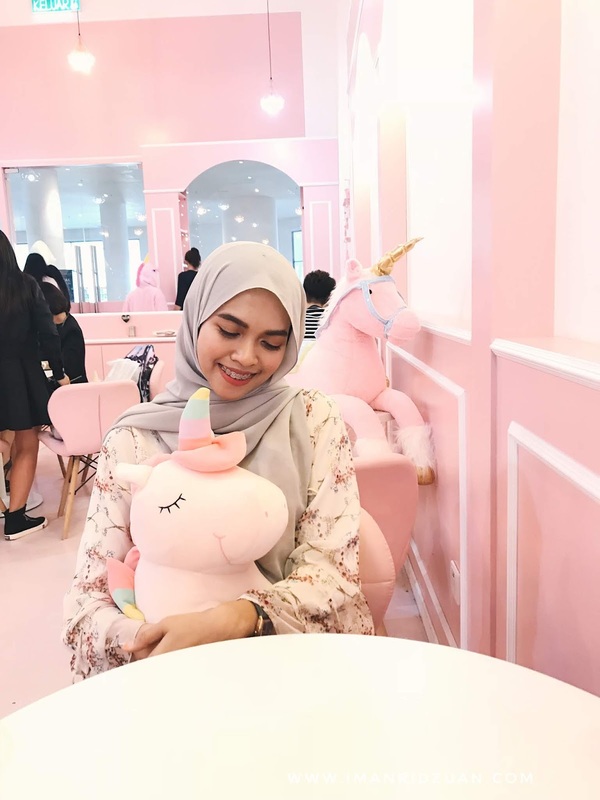 The baby pink walls with unicorn plushies all over the cafe makes me too happy for words. I've never felt as happy with any other cafes. Pink is one of my most favorite colors, and being in this cafe made me feel super relax. Cakes are portrayed through this golden glass window. This cafe focuses on desserts only, so I would highly recommend coming here for Hi-Tea. Me with my favorite unicorn in the cafe. As seen in the music video, this is exactly where Wengie sits woohoo! 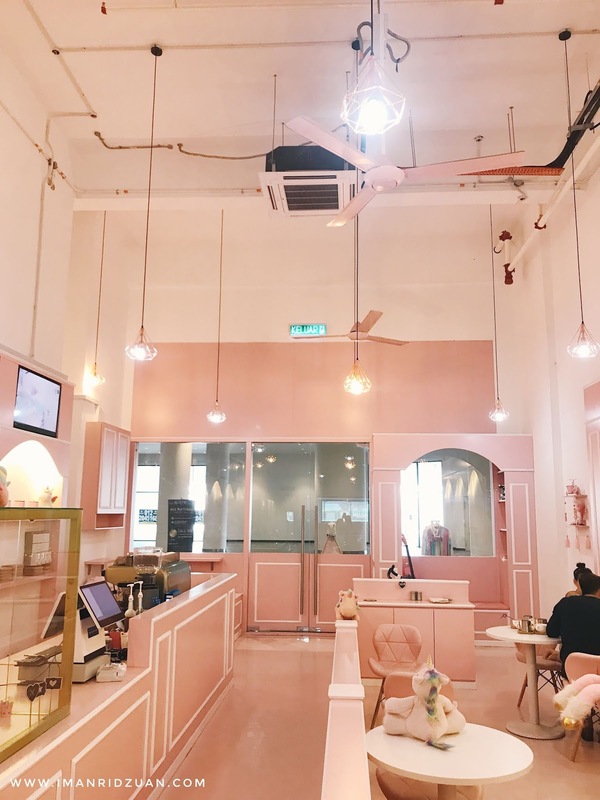 This cafe is now famous for this pink balls pit. It's like a ball pit, for adults. Definitely instagram worthy! 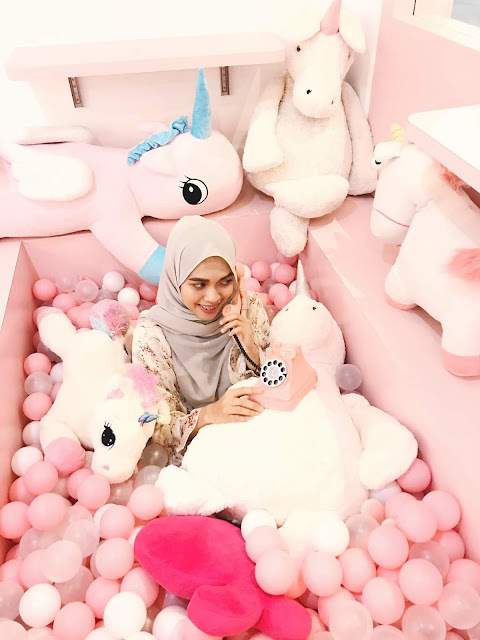 You do have to rebut this tub if there are kids in the cafe though, because they would conquer this area for sure hahahaha. I mean, I won't blame them! I felt like a little kid too when I entered this pit hahahha. Initially, I wanted to get a different dessert, but the waiter told us that it is their artisan's day off that day and it seems that he was the only one in duty at that moment, which is weird. So he can only prepare me this waffle with ice cream on top and their lattes. I don't mind though, since it is still delicious as in picture. The only complain about the waffle is the ice cream part for me. I think it tastes just like the ordinary ice creams that you buy from usual ice cream stalls here in Malaysia that you can get for RM2 per cone. You know, those stalls that sell ice cream, waffles, and corn in cups? Yea, it has the same artificial taste. I got pink latte for myself because it is pink, no judgement please, haha! Well, it tastes just like strawberry milk. The interesting part is that in this cafe, you can create your own latte art. They gave you a jar of microfoam and you can basically design your own pattern under waiter's guide. But like I said, because the waiter was the only one on duty at that time, he was very busy handling everything alone so I did not want to bother him. That's why I don't have any pattern on my latte lol, I don't have any experience to do it! The unicorn cake, my boyfriend got me as a surprised because he saw me looking and adoring it lol...I really didn't want to order it because it is a little bit expensive. It was selling at RM26 if I am not mistaken. It was pretty dry though as a sponge cake. 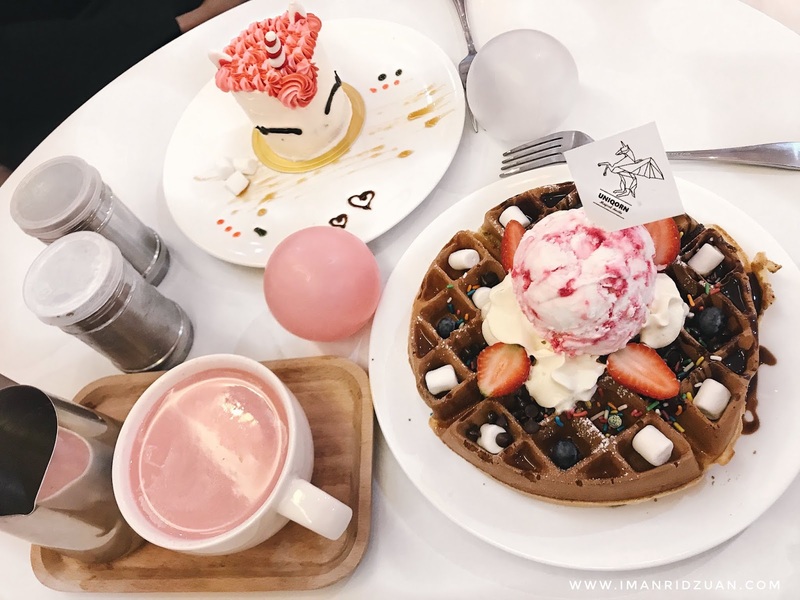 The waffle was RM16, and my pink latte was RM10. My boyfriend got a hot chocolate but I forgot to take the picture hehe sorry. Overall, it was a great experience. Not so much with the foods, I would give their foods 3/5. But for the environment and everything else, definitely a perfect 5!